This is very essential due to its bleaching properties. Lemon juice whitens the dark spots and makes it of an even tone with the rest of the skin. Its acidity and vitamin C properties make it a highly effective skin toning substance. In addition to the whitening ability of lemon juice is its exfoliating power. Lemon juice can be harsh on the skin and naturally leads to dry skin and should therefore be regulated or blended with milder substances like honey or rosewater if use will last long. Just apply the juice or the blend to the legs and leave for half an hour before rinsing with water. Do these twice daily for a period of eight weeks and you won’t believe the tone of your legs. Ensure you use fresh lemon to generate optimum effect. Onions have bleaching properties and whitening properties because they contain both sulphur and are highly acidic. These characteristics make onions, both red and white highly effective in clearing dark spots on legs. All you have to do is to slice the onions and rub on your legs two to three times every day. To make the juice, just blend the onion and preferably mix with other helpful substances like honey, rub on your legs, leave for about fifteen minutes before washing off. Repeat this two times a day and you will begin to notice changes after some weeks. Castor oil is highly effective in treating dark spots on legs and can be combined with other oils like vitamin E oil for maximum impact. The oil is popular as a great healing oil for good reasons. You can either use cotton ball to rub the oil on your legs or you can massage it on your legs. Leave for some minutes before washing off. If you consistently apply castor oil on your legs twice a day ( in the morning and evening) every day for four weeks, you will see wonders; your skin will begin to even out and you will simply love the sight. Applying yogurt to the dark spots on your legs is one of the mildest ways to even your skin tone. Yogurt has bleaching properties that whiten your skin and tone it out. Yogurt application not only whitens and evens out your leg skin but also makes it glow and appear healthy. An effective yogurt remedy to clear black spots from your legs will make you want to flaunt it to the world. All you have to do is apply the yogurt to your leg, leave for about 20 minutes and rinse it off with water. Ensure that you use no fat and sugar free yogurt. This is also a very common home remedy that you may be quick to ridicule but it does work like magic. Baking soda accurately clears dark spot such that no traces of its existence remain. Another perk to this remedy is that it is relatively cheap and ready to use. All you have to do is create a paste by mixing water with the baking soda powder, and then rub the paste on your legs. Leave for five to ten minutes before washing it off. Doing this once a day is enough and if you do it long enough, you will begin to see changes. Sandalwood greatly reduces hyperpigmentation and is one of the remedies that can be used preventively. As an anti-aging agent, it also slows down the melanin production rate thereby ridding the legs of dark spots. Mix sandalwood with water and rub on the legs. Leave until it dries off then wash off with water. You can do this as often as you can on a weekly basis until the spots clear off. You can also rub sandalwood oil on the leg to stay overnight before going to bed. Papaya is a major ingredient in many exfoliating creams so you can imagine what the real deal is about. Papaya contains enzymes and chemicals that will scrape off dead skin cells, bacteria, grime and everything that aids the formation of dark spots on your legs. 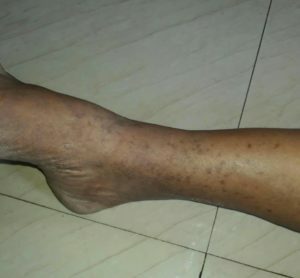 all you have to do is rub a handful of grated papaya on your legs and leave for about twenty minutes before washing off. Do this twice daily for some weeks until the dark spots clear out.